What is Abraham Lincoln most known for? Lincoln is most famous for leading the country during the American Civil War. His leadership in the North helped the country to remain strong and defeat the South keeping the country united. He also pushed for the freedom of all slaves throughout the nation. Abraham Lincoln came from humble beginnings. He was born in a single-room log cabin in Hardin County, Kentucky. His parents were Thomas and Nancy Hanks Lincoln. His father lost everything when Abraham was young and they had to move to Perry County, Indiana where they struggled to get by. When he was just nine years old, his mother died and his sister Sarah took care of him until his father remarried. Abraham had very little formal education, but had a strong interest in books and learning. Most of what he learned was self-educated and from books he borrowed. His family later moved to Illinois where Lincoln would set out on his own. As a young man, Lincoln worked a variety of jobs including shopkeeper, surveyor, and postmaster. For a time, he even split firewood with an axe for a living. He soon moved into politics and won a seat in the Illinois Legislature when he was 25. Lincoln served on the Illinois State Legislature for several terms. During that time he studied the law and began to work as a lawyer. He ran for the U.S. Congress in 1845. He won the election and served as a congressman for one term. After serving as congressman he continued to work as a lawyer. Later, Lincoln ran for the U.S. Senate, he did not win but he did gain national recognition for his arguments against slavery during the debates. In 1860, Lincoln ran for President of the United States. He was a member of the fairly new Republican party which strongly opposed allowing any of the southern states to secede (leave the country). The republicans were also against slavery. They said they would allow for slavery to continue in the southern states, but that it would not be allowed to spread to new U.S. states or territories. Lincoln won the 1860 election and was inaugurated as president in March of 1861. The southern states did not want Lincoln to be president. They did not agree with his policies. Before he was officially in office, they began to secede (leave the country). The first state to leave was South Carolina, but soon six more states followed and together they formed a new country called the Confederacy. This all happened after Lincoln won the election, but before he took the oath of office. The Civil War began on April 12, 1861 at Fort Sumter in South Carolina just a month after Lincoln took office. Lincoln was determined to maintain the "Union" of the states. He called for an army from the northern states to defeat the south. What followed was a bloody war that lasted four years and cost the lives of 600,000 Americans. Lincoln faced all sorts of opposition during the war, but managed to hold the country together. On January 1, 1863 Lincoln issued the Emancipation Proclamation. This was an order that freed the slaves in the Confederate States. Although not all the slaves were immediately set free, it paved the way for the 13th Amendment which would free all slaves in the United States a few years later. Today, Lincoln is often remembered for a short speech he gave at Gettysburg on November 1, 1863. It's called the Gettysburg Address. It was only a few minutes long, but is considered one of the great speeches in American history. The Civil War finally ended on April 9, 1865 when General Robert E. Lee surrendered at the Appomattox Court House in Virginia. Lincoln wanted the country to heal, forgive, and rebuild. He wanted to be generous to the southern states in helping them during the reconstruction. Unfortunately, he would not live to see the country rebuild. 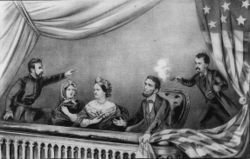 President Abraham Lincoln was shot by John Wilkes Booth while attending a play at the Ford Theatre in Washington D.C. He died the next day on April 15, 1865. Honest Abe was the tallest president at 6 feet 4 inches tall. He set up a national banking system while he was president. He also established the Department of Agriculture. He was known as a gifted storyteller and liked to tell jokes. He was the first president who had a full beard. He often stored things like letters and documents in his tall stove-piped hat.